After clicking on the "School" tab the user will be taken to the School Page. The school name will be displayed in the main area of the screen. New Will allow entry of the details for the school. Note - only details for ONE school can be entered. The message "School details already exist. Only details for one school may be entered." will be displayed if attempting to enter more than one set of details. Show Will display all the details associated with the school, but will not allow anything to be updated. Update Will display all the details associated with the school and will allow the details to be updated. 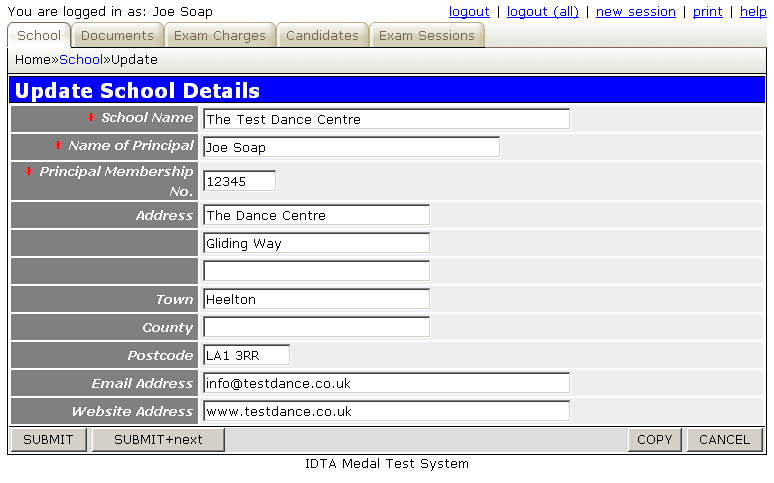 Exclude Grades This displays the Exclude Grades Screen allowing the school to determine which grades should be excluded from the Import Examinations process. School Name The name to be used for the school. This is a mandatory field. The name entered here will appear on the official examination documentation, and will also appear on all the reports produced by the system. Principal Name The name of the school principal. This is a mandatory field and appears on some of the official examination documentation. Principal Membership No. The membership number of the school principal. This is a mandatory field and appears on some of the official examination documentation.